This is Napolion. 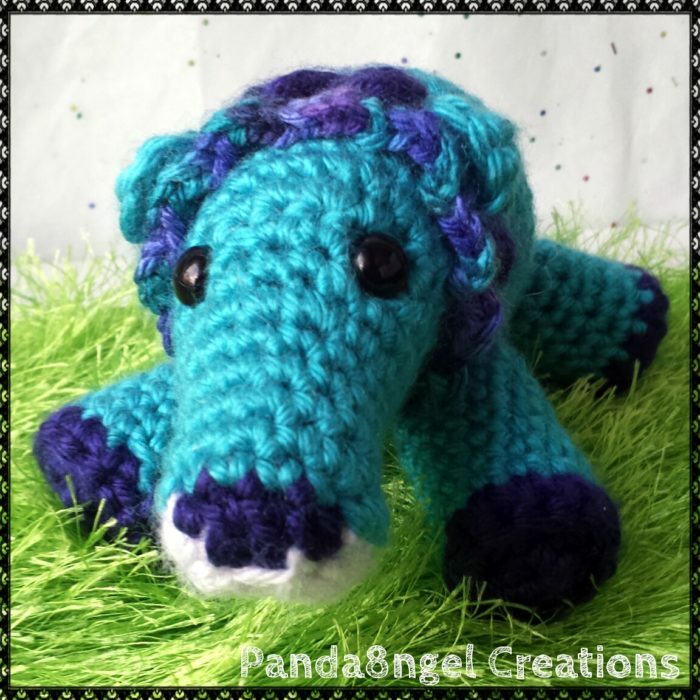 He is (obviously) a crochet lion, the pattern for which I am about to share with you :) Thank you to Beth Spaulding and Caroline Tart for suggesting the name (which I love, by the way)! Why not couple Napolion with Tau (Crochet Lion Lovie) and Brill (Crochet Lion Puzzle) to make a unique baby shower gift? A mini pride of crochet lions! Before we go any further I would like to point out my favourite part of this pattern: there is NO SEWING involved! The legs and ears are joined as you go. You don’t have to work away any tails of yarn either, except for the very last one, as all the tails of yarn can be pulled into the body and used as part of the stuffing. Although I have made my lion in yellows and oranges, you are not limited to this colour scheme in any way. Amanda Wong made this lovely blue lion and Dianna Smith made a pretty pink one. I hope to have a whole rainbow nation of lion pictures soon! 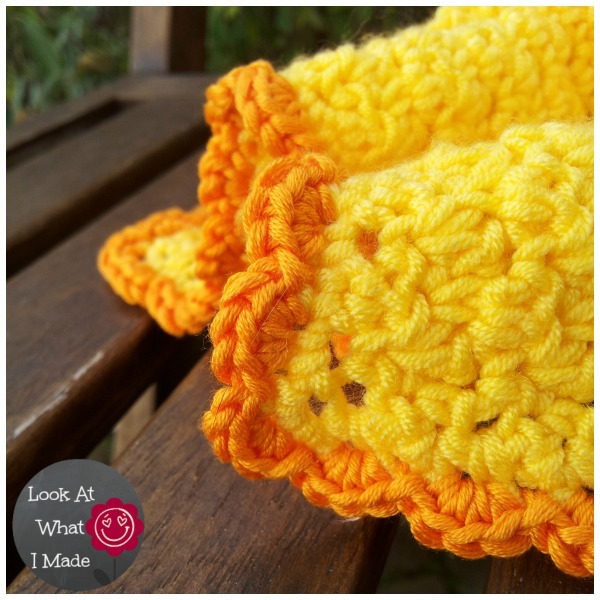 Using the hook and yarn specified, your crochet lion will be 10 cm from front to back and 10 cm high (4″ x 4″). I have used Patons Smoothie (Double knit yarn/light worsted weight/#3). I love this yarn NO END! It is smooth and soft with the tiniest amount of shine. The blurb on the website says that you will find it hard to believe that it is 100% acrylic and I have to agree. This is my absolute favourite yarn ever and is quite affordable. I usually buy my yarn from Woolwarehouse (UK), but Black Sheep Wools sells it too, and with international shipping to boot. So if someone who loves you wants to buy you the perfect gift, get them to order you some of this yarn. The colours are a lot more vibrant than they appear online. I use running stitch markers to help me keep track of the beginning of each new round. A running stitch marker is a piece of scrap yarn used to indicate the first stitch of each round. Simply place the piece of scrap yarn across your work BEFORE making the first st of a round and then flick the yarn backwards/forwards before the first st of every subsequent round. This will form what looks like a running stitch up your work. I also use short rows to help with the shaping of the head. Short rows are just rows that do not begin and end where rows traditionally begin and end. When you work with short rows, you will notice a “step” where the previous short row started. When coming off this “step”, you need to make sure that you work into the next available stitch after the step, not the stitch at the base of the step which already contains a sl st.
Read this post if you would like to know more about running stitch markers and short rows. Please note that this walk-through employs joining in the round, which does not apply to Napolion as he is worked in a spiral. If you need additional help with working in the round in a spiral, you can have a look at this tutorial. 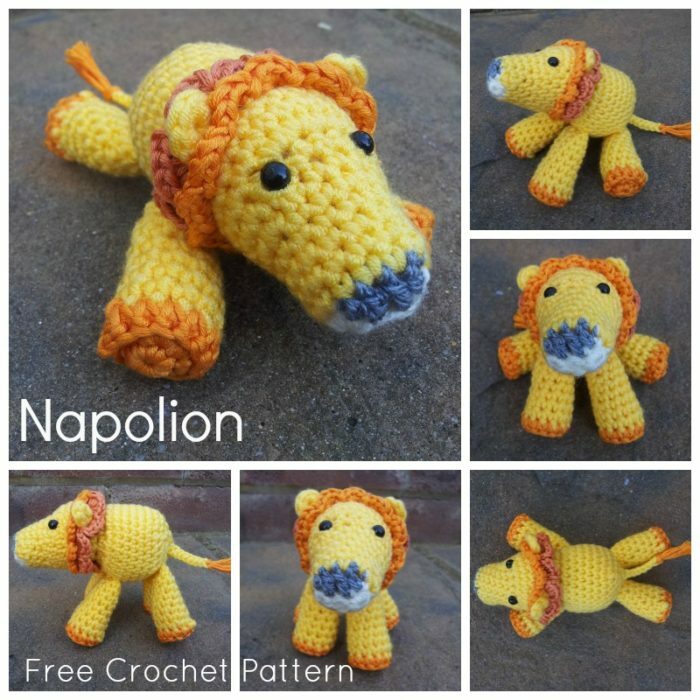 You can find the FREE PDF Pattern for Napolion HERE in my Ravelry Store. I would like to thank the following ladies for testing this pattern for me. I remain heavily reliant on testers to ensure that my patterns are as precise and clear as I can possibly make them. A special “Thank you!” to Venetia Smith, who is both my friend and meticulous “editor”. She makes sure that I dot all my i’s and cross all my t’s, hehe. Some of us need more help than others. You can see more of my testers’ lovely creations here. Feel free to make as many as you like, Deborah. I just ask to be credited as the designer. I have finally resided to make this for a little Jordan I know. At first I was going to make one of your Amish puzzle balls and a knitted monkey (pattern can be found here: http://www.allaboutyou.com/knitting-patterns/toys-to-knit/knit-a-monkey-free-pattern-53828) but I’ve got to be honest, I only have one leg done, I’m not that fast at knitting (I’m not slow either but…) and we only have 13 days till Christmas. I’ll just give it to him in May on his b-day. He keeps telling me he wants a lion anyway :)! Biggest hint to not stress myself out over a monkey! 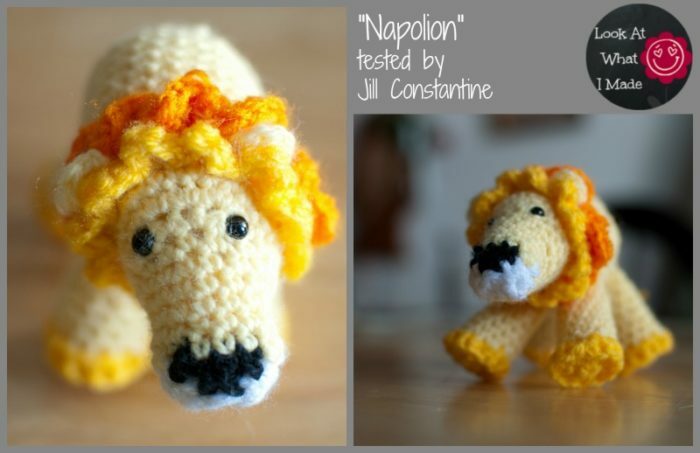 Besides I’ll probably give in to wanting to make Napolion in the middle of knitting :)! Bad Carrie! I haven’t had time to make your lion but I have enjoyed your comments. I admire the fact that you create patterns and also do your own posting on your website. One mention, you call the stitch markers, I use safety pins they work great too. As for your post it is easy to read and looks like all the information is there. I prefer the list posting, like the one shown. Thank you, Marileen. Safety pins are an excellent idea for stitch markers. Using a piece of scrap yarn, though, means that you can make a running stitch marker, which runs up the length of your work, marking the beginning of each new round. This is great because if your running stitch marker starts leaning the wrong way, it tells you that you have done something wrong.